The U.S. is sending mixed signals about the size of its fighter fleet. It has implications for the Pacific and beyond. The Pentagon has released a new 30-year plan for its aviation force – its second such plan in two years. The document projects an essentially constant force of 14,000 Army, Navy, Air Force and Marine Corps warplanes, helicopters and medium and large drones through the early 2040s. But inconsistencies between the plans belie hidden volatility in the U.S. air arsenal. The previous aviation plan, published in February 2010, forecast a force structure of 3,168 manned fighter-attack aircraft in 2013 declining to 2,929 aircraft in 2020 as new F-35s slowly replace a larger number of older F-15s, F-16s and other jets. The more recent plan, by contrast, has today’s roughly 3,374-strong fighter force actually growing to 3,448 in 2020. 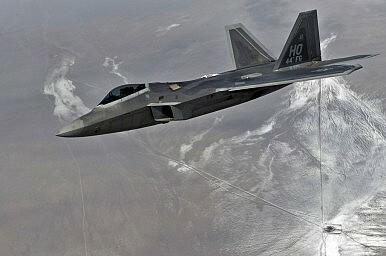 It’s not clear how the 2012 report could show larger current and future fighter holdings than the 2010 report, considering that in just the past few months the Pentagon has deferred production of nearly 100 F-35 fighters and cut some 120 existing Air Force A-10s and F-16s – reductions not expected in 2010. No new production appears to have occurred that might make up for the retired and delayed airframes. Semantics could account for the apparent inconsistency between the plans. It’s possible that the 2010 plan counted only “combat-coded” aircraft, whereas the 2012 plan counts combat-ready planes plus aircraft held back for testing and training and as crash replacements. If so, the Pentagon could prevent future confusion by defining its terms more clearly and sticking to one set of definitions across reports. The plan also obscures other changes in the American aerial arsenal. In February, the Air Force announced it would reduce its fleet of long-range, heavy airlifters from 312 C-5s and C-17s to just 275 of the huge planes – a cut of more than 10 percent. The 2010 report breaks strategic cargo planes into their own category, but the 2012 report folds them into an overall “airlift/cargo/utility” force that also includes helicopters and short-range supply planes belonging to all the military branches – and which holds steady at around 4,500 airframes through 2020. Needless to say, it's disingenuous to compare an Army transport helicopter that can carry just a couple thousand pounds of cargo to an Air Force strategic airlifter that hauls up to 130 tons. The combined airlift category in the 2012 report masks deep cuts to transport capacity. The 2012 plan also omits aircraft production projections that were present in the 2010 report. That omission disguises the Air Force’s recent decision to cut purchases of new MQ-9 armed drones from 48 per year to just 24. Again, semantics help bury the cuts. As with airlifters, in the 2012 plan the Air Force’s medium drones are lumped into a category that also includes Army scout helicopters, Air Force and Navy radar-warning planes and other reconnaissance and surveillance aircraft, presently numbering around 1,200. In that context, a 50 percent production cut for the Pentagon’s main armed drone doesn’t seem so shocking. The new aviation plan shows the Pentagon’s overall aerial force holding steady for years and even decades to come. But within that top line, big year-on-year changes underscore the uncertainty over America’s aerospace future. Japan has just signed up for the F-35 fighter. It’s not the only Asian country that’s been thinking about this.